Things got dicey on Memorial Day when the rain came down in such torrents that the street in front of my house became a river. Around midnight I noticed a shallow puddle spreading across my living room floor from under the baseboard. I stayed up most of the night, sponge in hand, defending my house from water intrusion. I thanked my lucky stars that I had decided to purchase flood insurance the previous summer. Fast forward to early July. The workers arrived to begin the repairs. They quickly pulled up the damaged floor. A workman cut into the drywall – and the interior portion of the wall crumbled into his hands like a soggy brownie. “Hidden damage”! A huge hole was cut in the living room wall and it revealed that the sheathing had completely crumbled. The entire south wall of the house had been compromised. What followed was a long wrestling match with insurance while repairs were put on hold. During the heavy autumn rains, more water began invading the living room, this time on the north side. It seeped in first from behind the chimney. A new chimney cap cured that, but then water came in through the glass patio doors and through the walls. So much for lucky stars. Well. I missed entertaining, but I could live comfortably enough in my bedroom at the east end of the house and my eat-in kitchen at the west end. I merely commuted through the construction zone in the middle. Then in November a pipe broke in the bedroom wall, while the back door to the kitchen began to fall off its hinges. Trouble on every side! A dedicated plumber braved another bad storm to fix the pipe, but now I had a hole in my bedroom wall too. With the holidays approaching I was glum about my ugly house and worried that the expense of repairing it all would be overwhelming. At a friend’s suggestion, however, I decided to reclaim the living room. I chose a soft color scheme – silver, blue, and green. I slid the furniture back into place, put some pictures up, and some scatter rugs down. I covered the gaping hole in the wall with a plain white sheet. 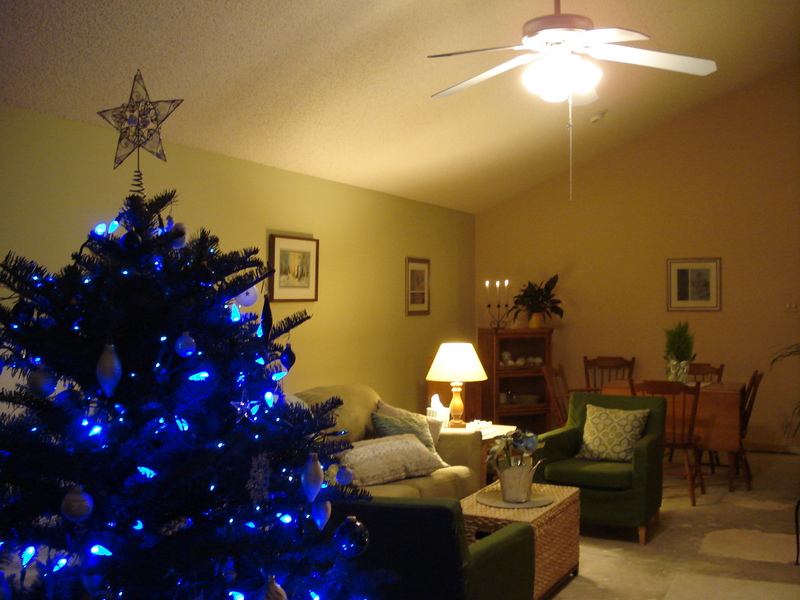 For years I had thought about doing a blue and silver Christmas tree, and I decided this was the year. I figured blue lights would complement the concrete floor. Actually, the room didn’t look half bad if you kept the lights low! Just before leaving for Christmas travel, I received a call from my insurance company telling me they would cover the replacement of the living room wall. Coming when it did, the news felt like a Christmas present. All the same, it felt good to get away. Once back in Houston, I decided to throw my usual holiday party for my Houston friends, who all know about my homeowner woes. They all entered in, bearing lovely and luscious gifts, and stayed all afternoon! After they had left, the glow remained. Somehow, even its state of disrepair, the house is beautiful again. I am happy to spend time in my sparkling living room. The concrete floor no longer depresses me. Tonight is Twelfth Night, the last night of Christmas and, by tradition, the eve of the luminous feast of Epiphany that celebrates the arrival of the wise men at Bethlehem. 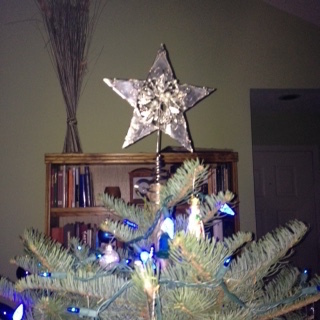 The colors of Epiphany are white and gold, but this year my own gleams blue and silver. I keep remembering a favorite childhood hymn for this time of year. Isn’t God able to shine through us, if we let Him in, even though we’re in a state of disrepair? 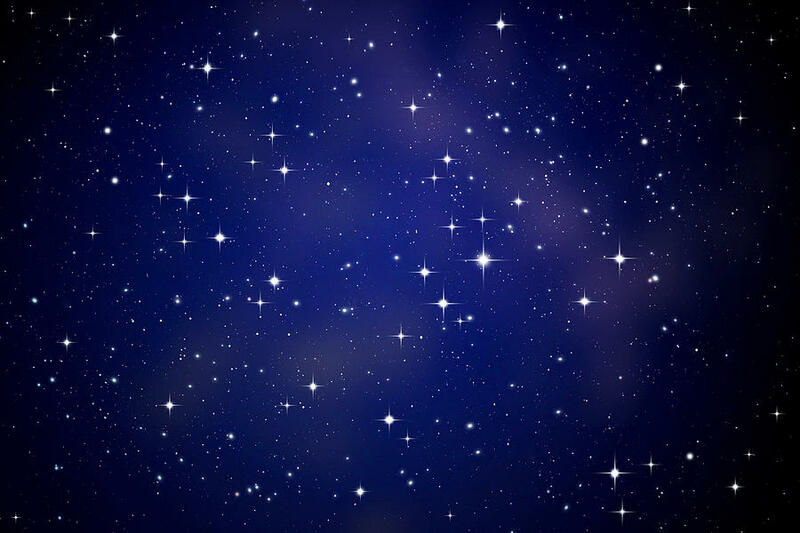 Light shines in the darkness, and silver stars twinkle through every tanglewilde. Blessings to you on the Feast of the Epiphany, and all through 2016! What a nightmare! I’m not surprised you have been able to handle it with your typical grace, but I still don’t envy you the next couple of months. Typical grace? If my cats could talk!